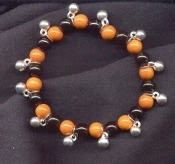 Funky 8-inch BEAD STRETCH FANCY CHARM BRACELET - Orange, Black and Silver Halloween Team Novelty Costume Jewelry - Great-to-add-your-own-Charms - Cheerleader Sports Spirit. Bengals, Giants, Tigers Team Fan Halloween Party Favors - Tiger-lovers costume jewelry features metal and acrylic beads. Convenient stretch to fit most adults and older children, as pictured. 8-inch (20cm) stretch. Ready-to-Wear!